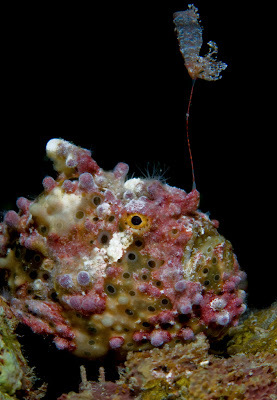 Very few creatures on earth are as amazing and diverse as the frogfish. The discovery of one on a dive can excite any self-respecting diver or photographer as everyone want’s to get a chance to see it. 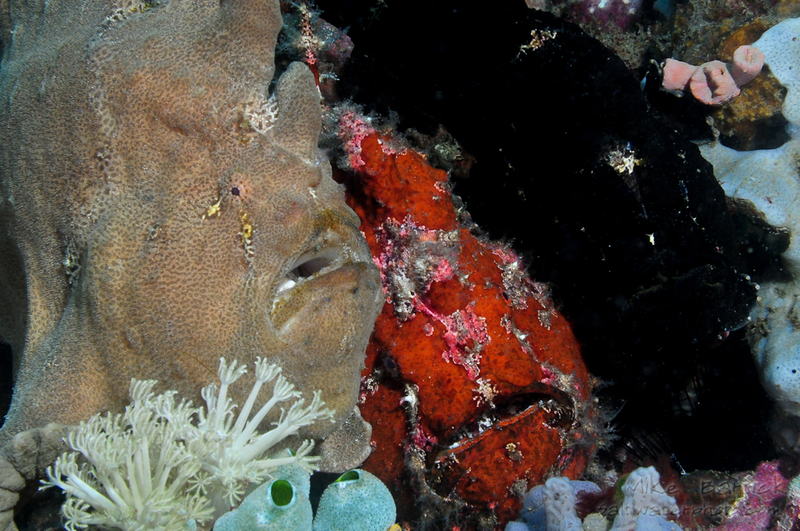 At first glance the frogfish remains motionless, appearing as a large headed globose and scabby creature that could hardly fend for themselves. But in reality the frogfish is a calculating and veracious predator that has truly mastered their domain. But what makes them so unique isn’t just their coloration, size or texture or the ability to remain motionless for hours at a time. 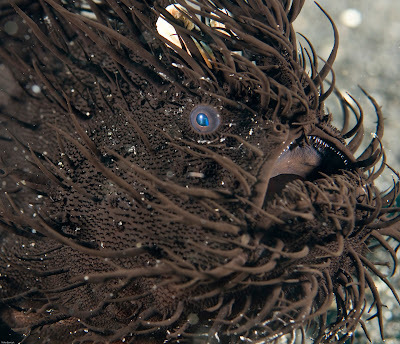 It isn’t even the little jets behind their legs that helps them swim, what makes them truly unique is that they are all a type of anglerfish that come equipped with a fishing rod and lure. 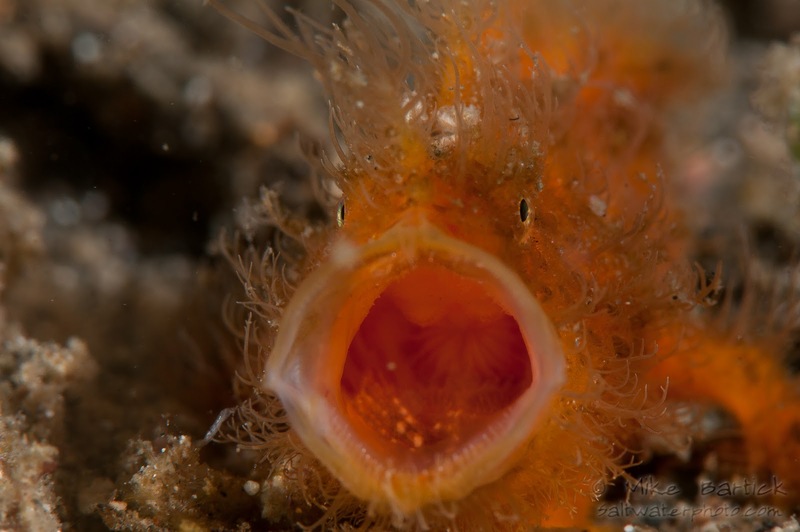 If that isn’t enough to grab a photographers attention then im not sure what is, so lets take a quick peek at a few more uncommon facts of these amazing critters in the secret world of frogfish. Ranging in color even within the same species is not uncommon making them tough to identify. 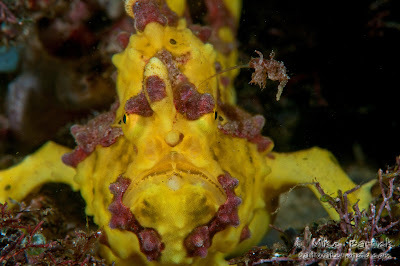 This yellow warty is squaring off with my lens port evidently having had enough of my presence. Looking closely you can see that the lure has sustained damage and is now bent to one side. 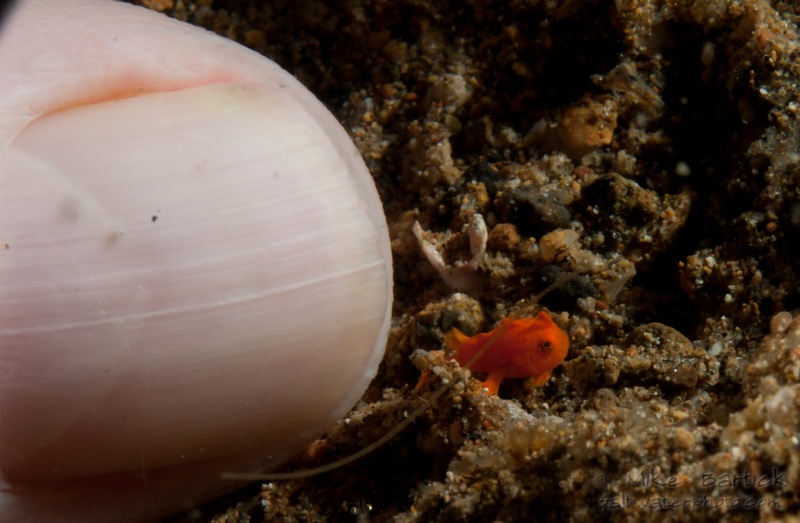 The smallest fully grown frogfish is the miniscule pygmy frogfish (tuberosi) which when fully grown will reach a maximum size of 1.25 centimeters. 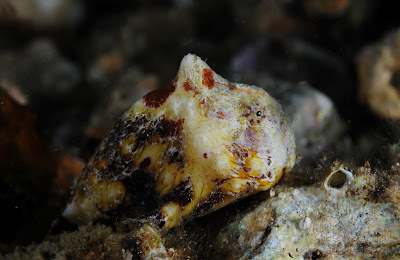 Found living amongst rubble in the shallows near runoffs and estuaries. From the roughly 45,000+- eggs released very few are successfully fertilized and even less make it to the through hatchling stage often being consumed by their siblings. Soon after the juveniles emerge from their eggs they begin to hunt, consuming mycid shrimp from the sand for quick energy. The bright orange coloration could mimic poisonous flatworms to help them survive immediate predation. 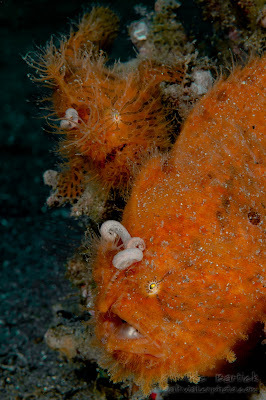 Camouflaged hunters, the Hairy Frogfish (Antennarius striatus) are amongst the most sought after critters worldwide and are considered a holly grail find for photographers and divers alike. They can range from pink to black in color but typically have visible lines or stripes on their body. The A. striatus is normally found on the substrate or perched just above it. They will live out their entire lifecycle here and have adapted some very unique survival tactics in the process including an oversized worm like lure, the use of pheromones to hunt and its namesake hairy appendages. Yawning amongst all frogfish could be a show of stress or aggression or even an attempt at appearing larger than what they really are to ward off the paparazzi. 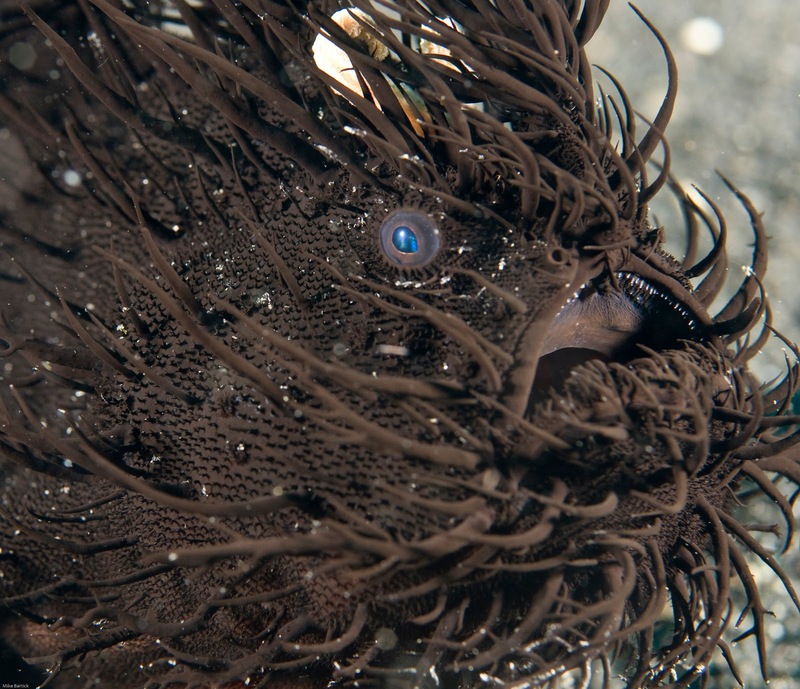 The Black version of the hairy frogfish is considered rare and was a treat to see. 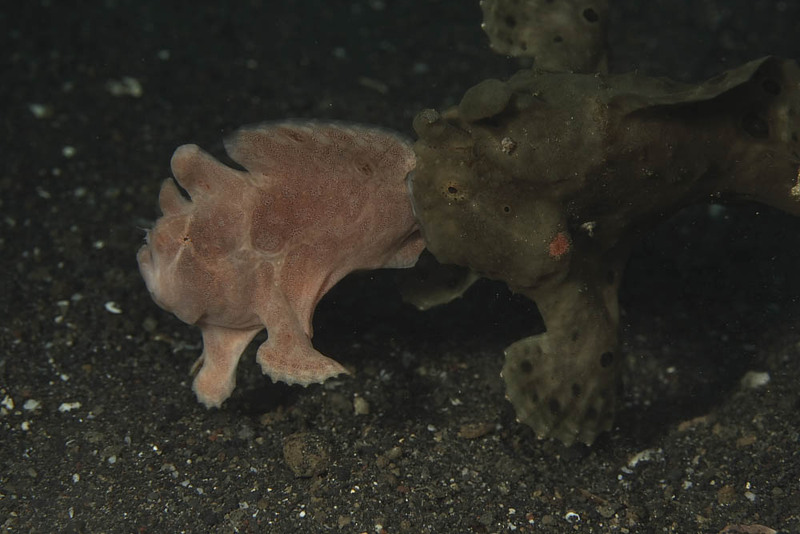 It proves how adaptive frogfish fish can be even within the same species. The black coloration helps it to blaend with the black sands of the region. The male is attracted by an irresistible pheromone produced by the female. Antisocial Behavior in frogfish is often seen before a mating cycle has begun. The pushy male just wont take NO! for an answer and assuming the female was a little more than irritated by the male suitor, she let him have it. 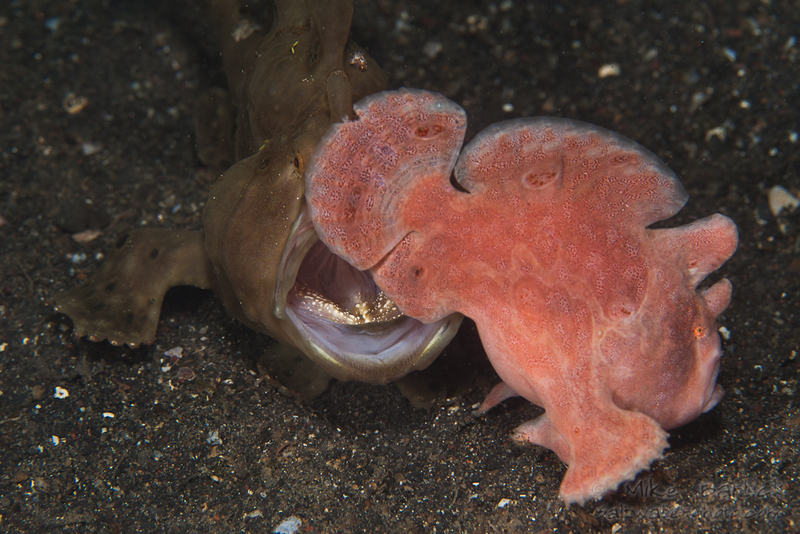 There isnt any exterior organs or markings to tell a male frogfish apart from a female but the behavior can sometimes give it away.